Thirteen rivers reach the sea by Indonesia’s capital on Java's northwest coast. 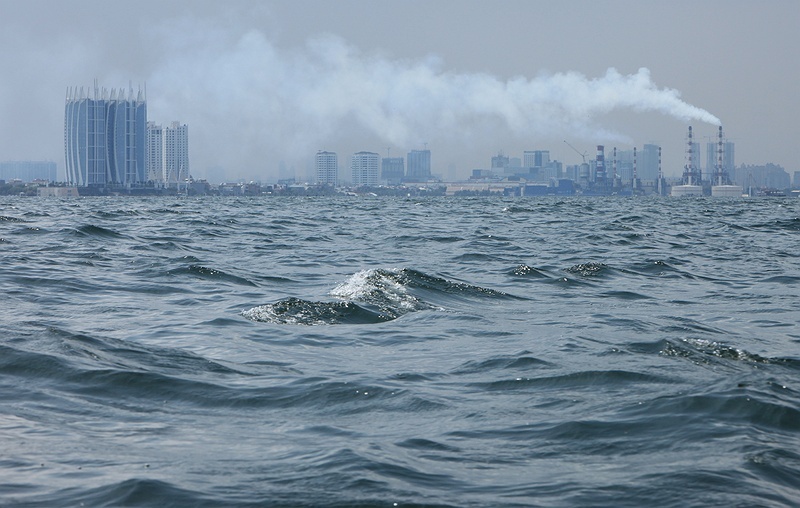 With a population of almost 10 million and forty percent of the city below sea level, Jakarta is one of the most vulnerable places to the effects of climate change in South-east Asia. The close proximity to the ocean, low topography, clogged rivers, drains swelling with pollutants and debris make Jakarta vulnerable to extreme weather events and rising sea levels. Some of the poorest and most densely populated areas of the city are around the north where extensive networks of slums house economic migrants from all over the country. They come to settle in the capital in the hope of a better quality of life and to find employment. It is these communities that will be hit the hardest by climate change. 70 percent of the city was flooded in 2007 as heavy rainfall brought depths of 4 metres in some areas killing 50 people and rendering 350 000 homeless. This problem has been made worse since the city is sinking. Construction of tall buildings and the increasing extraction of ground water have caused the land to subside. The loss of ground water supplies and increasing population will further exacerbate these problems. With resources pushed to the limit there is little room for change. The 2008 IPCC report on Climate Change and Water points that households in Jakarta without water supply spend 25 percent of their income on buying water.